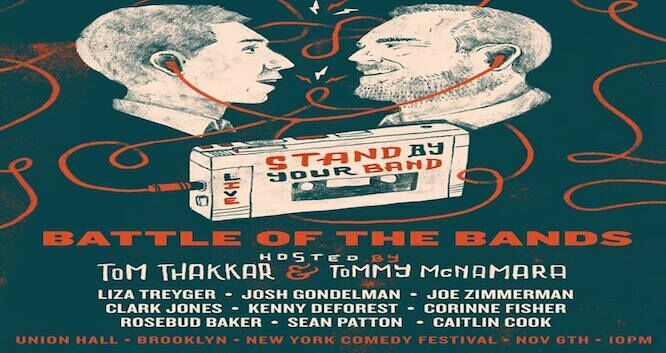 Tom Thakkar (Conan) and Tommy McNamara (Onion Sports), hosts of the podcast Stand By Your band (featured on AV Club) bring you this battle of the bands tournament where 8 of New York’s best comedians each compete to defend a guilty pleasure band they love. This edition features hotly contested matchups like Spin Doctors vs. Hootie and the Blowfish (Joe Zimmerman vs. Josh Gondelman), Spice Girls vs. Bieber (Corinne Fisher vs. Rosebud Baker), Coldplay vs. Dave Matthews Band (Clark Jones vs. Kenny Deforest) and T Pain vs. 311 (Caitlin Cook vs. Sean Patton). Winners will be decided with the help of special guest judge Liza Treyger! Audience members will also have the chance to fill out a bracket with their picks, and prizes will be awarded to whoever gets it right! No matter what you think of the music it’s going to be a great show!